Escape Skagway with a visit to Chilkoot Lake State Park in Haines. Board a high-speed catamaran in Skagway and fly through the water to Haines, admiring steep fjord walls and unnamed waterfalls along the way. 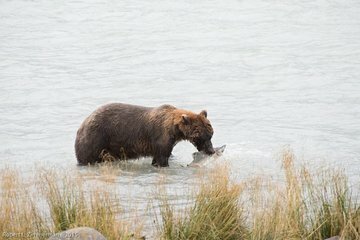 Meet your naturalist guide at the park entrance, and discover a lake rimmed by snowy mountains, a river bursting with salmon, Tlingit cultural sites, and wildlife including bald eagles, brown bears, and harbor seals. We ended up with a private tour with Jen after ferry ride. She was great, we saw 6 bald eagles. The area is beautiful! Highly recommend this tour!